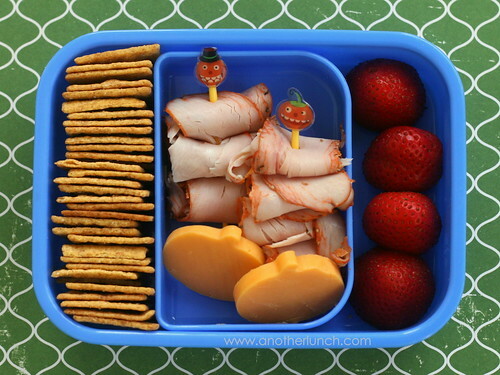 Packed in this bento box: a row of Wheat Thins crackers, Boar's Head peppered turkey, a couple cheddar cheese pumpkins, and a patch of lovely organic strawberries. 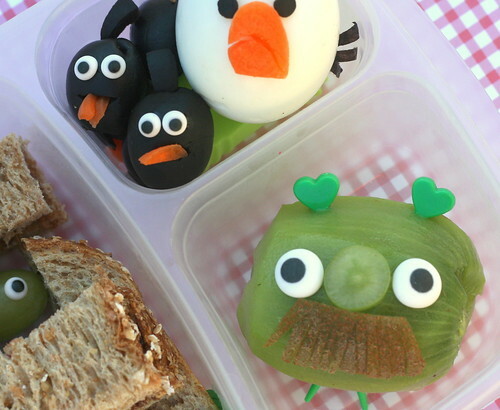 The turkey is threaded on two cute homemade bento picks. 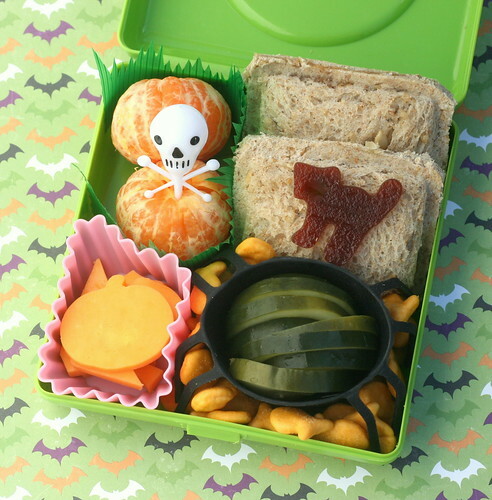 I'm a total slacker this year with the Halloween bentos! 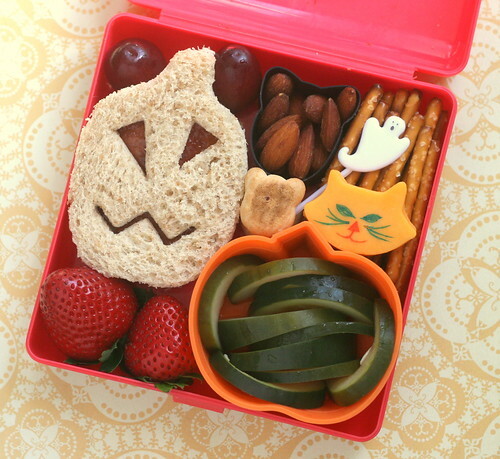 Last year I was loving (love, love, LOVING) doing Halloween bentos and I just can't muster up the enthusiasm this time around! My apologies to all the seekers of spook. Man, I don't even have a Halloween costume for Tyler yet. I think I'll be ransacking the dressup bin and see if I can find anything that is small enough to fit him. Lame Mom of the Year, right here! 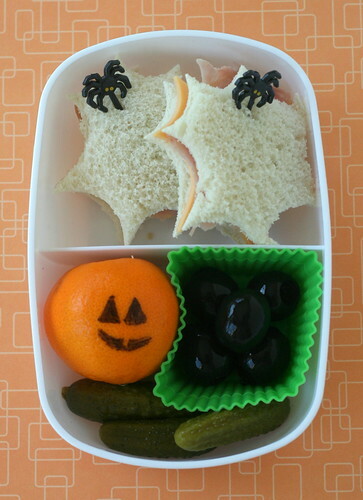 Remember the other day I made my demanding preschooler my little princess those little sealed square-ish sandwiches in a bento and she complained they were not cool for Halloween? Hmph. Well, I thought I'd make her another jack-o-lantern sandwich, but to get back at her add some Halloween spookiness I attempted to make it a SCARY jack-o-lantern. Not all smiley like that last one. 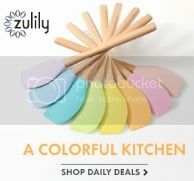 I got my face shapes ready...I found the wiggly mouth shape from a set of popsicle tools from Williams Sonoma. I knew instantly it was meant for a jack-o-lantern grin. Can't you envision the menacing face they will make? Ooh, I was reveling in the delicious passive aggressiveness frightful fun! It's not scary at all! In fact Paige squeeled, "oh my! This jackawantern looks nervous! Aw, poor little guy." 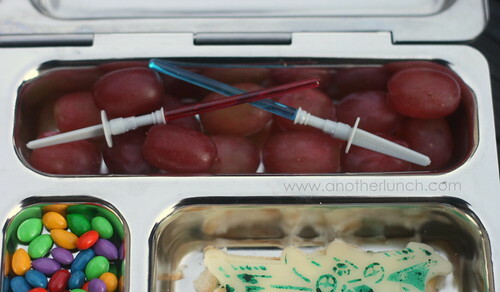 I just thought I'd share an idea to make your own cute bento picks. 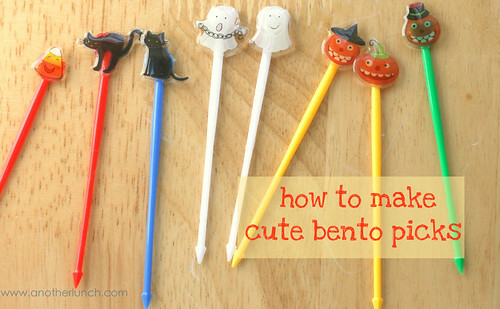 :) It's nothing crazy creative, definitely not reinventing the wheel, but a fun and easy little craft that can help add a bit of cuteness to your bento boxes. 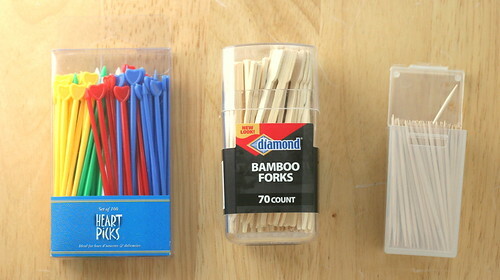 Regular tooth picks and bamboo forks are really easy to find - I've seen the bamboo forks everywhere from Target to party supply stores. I like the plastic picks because they are washable and sturdy...I found this box at Dollar Tree. Any small stickers will do. I really like the little plastic stickers that are kind of bubbly and thick. I found cute Halloween ones at Target. 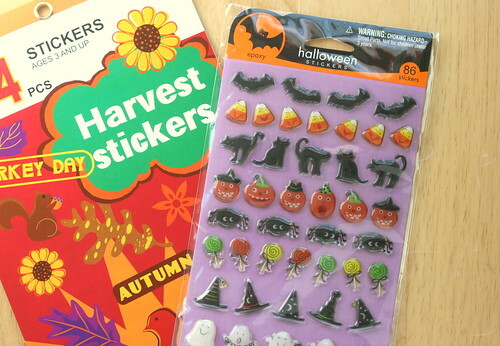 The fall stickers are from either Target's Dollar Spot or possibly the cheap bins at Michael's. I got those last year and can't recall exactly. 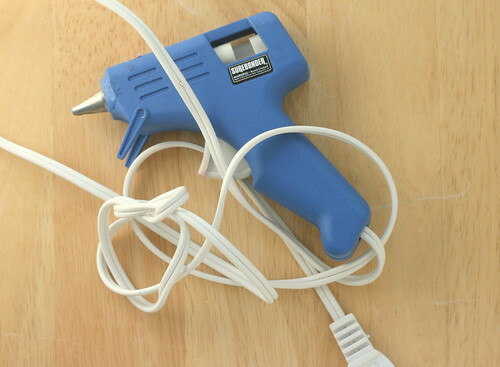 You'll need a glue gun, possibly. 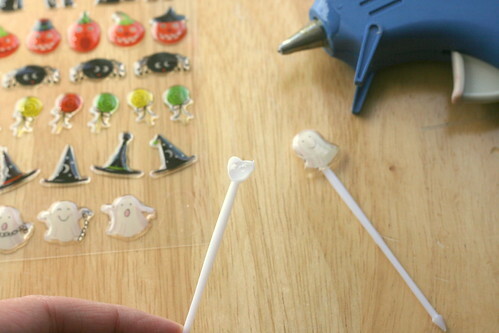 Definitely if using the cute little plastic stickers, but not for regular paper stickers. Step 2: glue stickers on picks. Just a dot of glue will do. 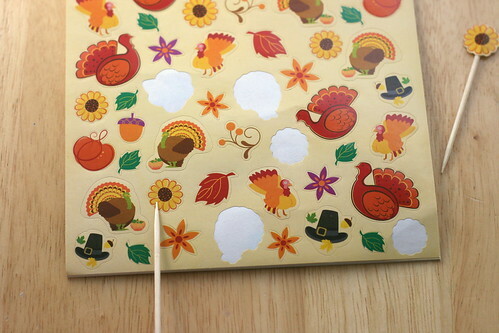 Place sticker on glue. Smile at the cuteness. To help ease the stickiness on the back of the sticker you can rub a drop of dishsoap and rinse off. alternate Step 2 for paper stickers. For these picks I used stickers that were mirror images. The same size, same shape, same image, just facing opposite directions. 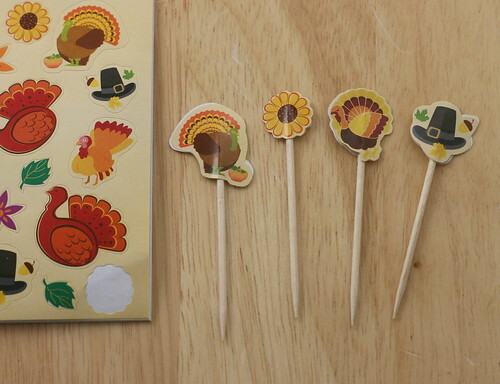 See the two turkeys where the toothpick is pointing? Those are perfect. 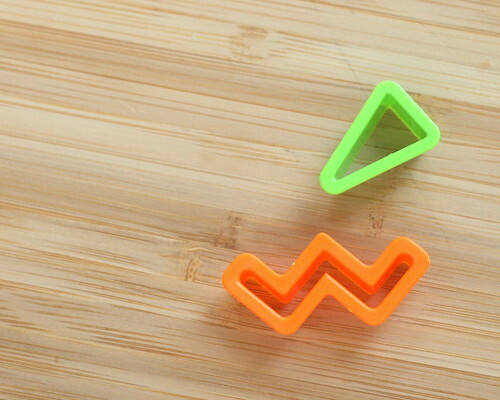 Take the two like-stickers and sandwich a toothpick end between them and press firmly. 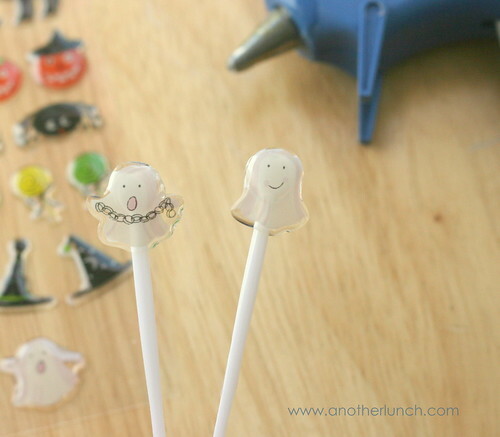 Making your own picks can be a fun craft to do with your kids. 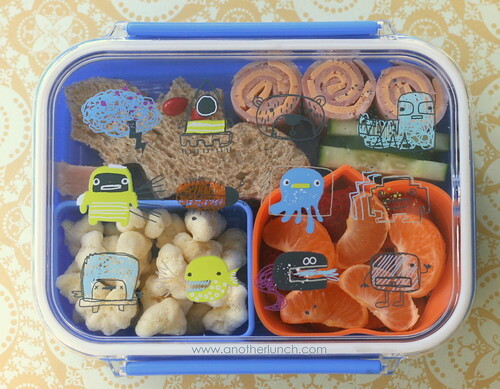 Homemade picks may be a good option if you have kiddos who "accidentally" don't remember to bring home their regular bento picks, or for field trips (or other days a disposable lunch is needed), or to spice up a food tray at a class party! There are times that despite my best efforts the bento box just doesn't come together the way I had hoped. This was one of those times. 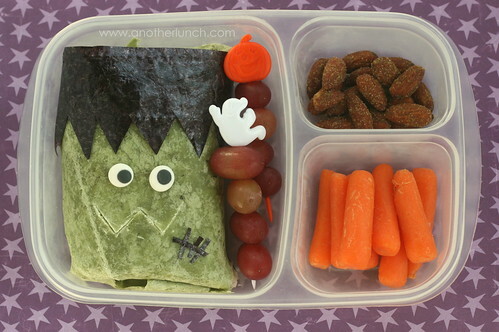 This bento lunch was hauntingly awful. There is a little fruit leather scaredy cat cut with a mini cutter for a bit of decoration and I used grassy barran to keep any moisture from the clementines off the sandwich bread. One piece of the cheddar cheese was cut into a pumpkin shape using a mini cookie cutter, with the scrappy pieces hidden under it. Paige informed me on this day that she only likes peanut butter and jelwee sandwiches and requested I stop putting "that other stuffs" inside them. 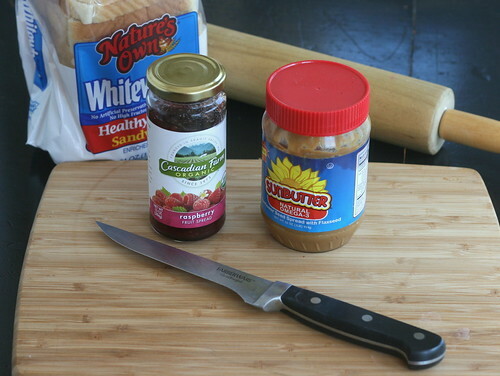 So pb&j it was. 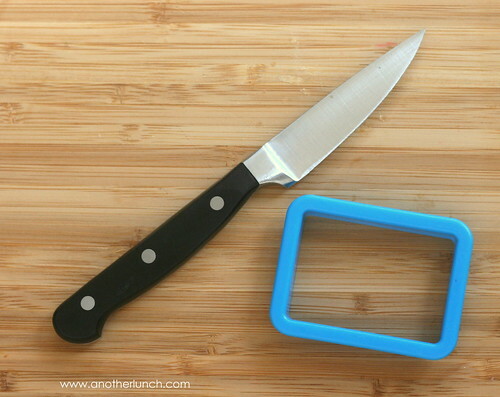 I sealed the little sandwiches using a Play-Doh toy from the kids' stash and a sharp knife. 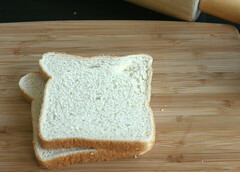 I used the top/wide side of the cutter to smash the bread (and seal it) and used the knife to trim around. 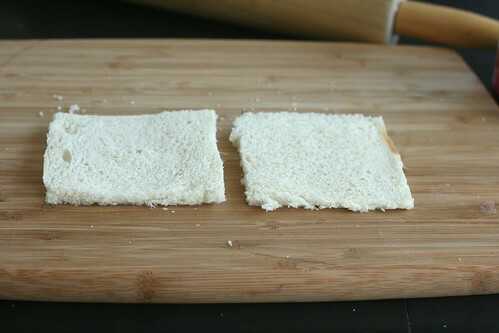 I was able to make one mini sealed sandwich per bread slice with very little left to waste. 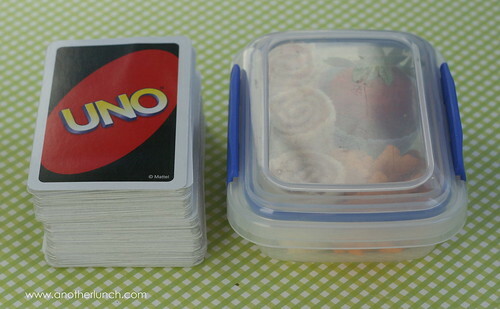 It's always fun to find regular items around the house to use for bento-ing. :) Fun until the little sassy pants girl informs me that square sandwiches are not very cool for Halloween and what she willy wanted was another jack-o-lantern sandwich. In the words of Charlie Brown, GOOD GRIEF! The cucumber mishaps were born from a cucumber idea gone awry. My idea didn't work out so I hacked them up and tossed them in the silicone cup. 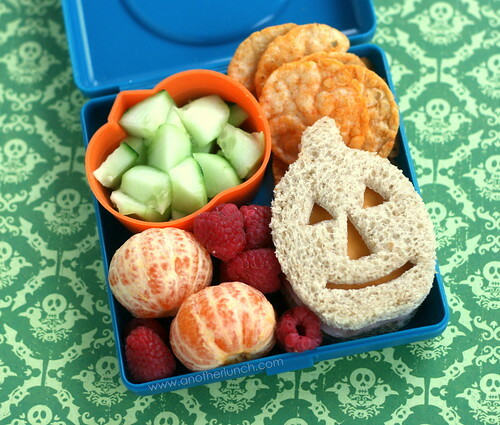 The jack-o-lantern sandwich was made simply using a pumpkin shaped cookie cutter and then using tiny bento cutters to make the face. The cheese inside the sandwich shows through nicely. 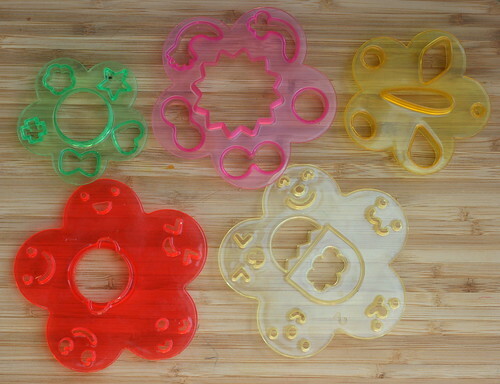 I've purchased a lot of these little cutter sets. You can find similar ones here and here. He's got the exact same foods as his big sister, just in a less inspired presentation. 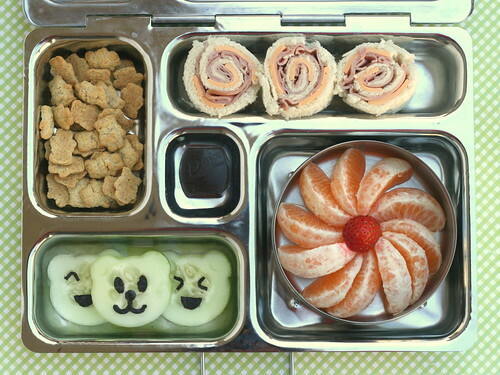 Almost every time I'm making a bento for Paige I'm making one for him too, his are just (almost always) not as cute, and usually the landing pad of all the scraps. Luckily, he doesn't mind (yet). :) The bread used to make his sandwich was the leftover bread from Paige's jack-o-lantern sandwich - note the rounded shape on the cut side! This box is a sandwich box I found at Marshalls a year or so ago. 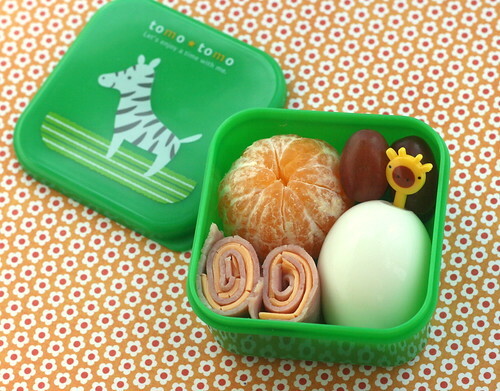 This bento may be teeny weeny (4" square! ), but it was a pretty filling snack/mini lunch. In the top section are two spider web ham & cheese sandwiches, secured with spider picks. In the bottom section is a clementine orange jack-o-lantern, mini pickles goblin fingers, and a silicone cup of black olive spider abdomens. Nom nom nom. 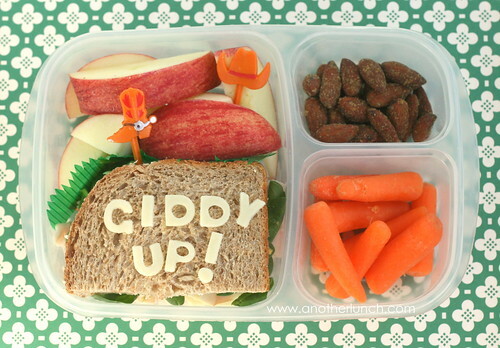 This scrumptious meal is served up in a Sassy Box. In the large compartment the PlanetBox big dipper dish holds a citrus-y flower of clementine orange segments with a strawberry center. 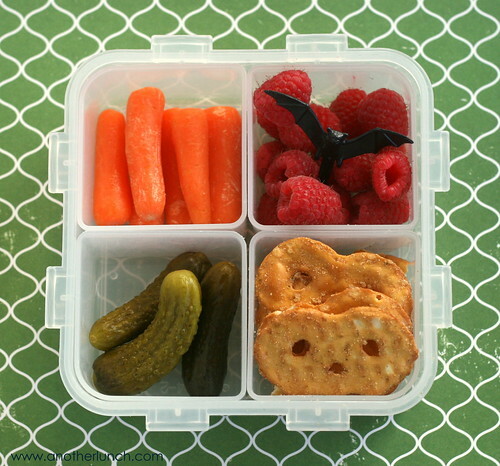 Side sections: mini Teddy Graham crackers and cucumber bears with nori face details. The tiny treat spot holds a piece of dark chocolate. 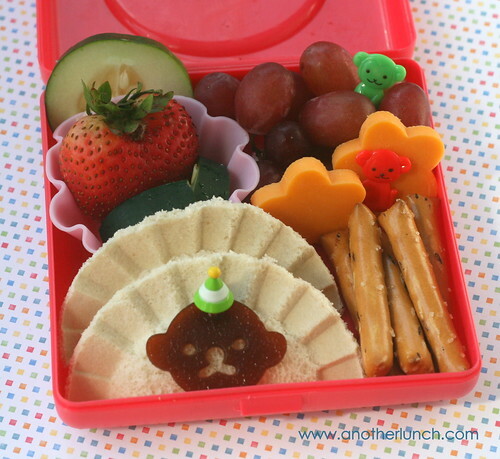 The cucumber bears were cut with a small bear-shaped cookie cutter and the nori faces were made with a nori punch (I got mine from JBox). I've had this stuff in my pantry forever and have just recently started to enjoy working with it. Eating it on the other hand.... I'm still working on that. 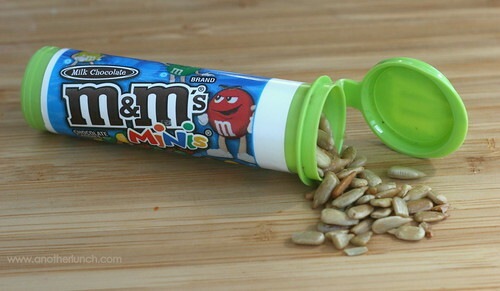 :p Paige and Tyler will eat it if it's in tiny piece like this, Ethan thinks it has cooties. Anyone else playing with nori? 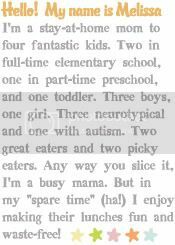 I'd love to report after all this time that Ethan is suddenly a lot less picky than he used to be...but I would be lying if I did. Sigh. 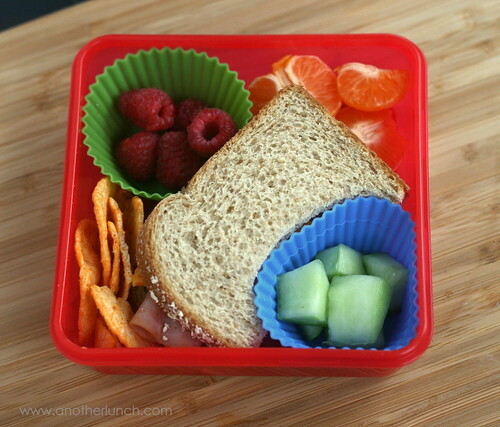 His lunches look much the same as always. 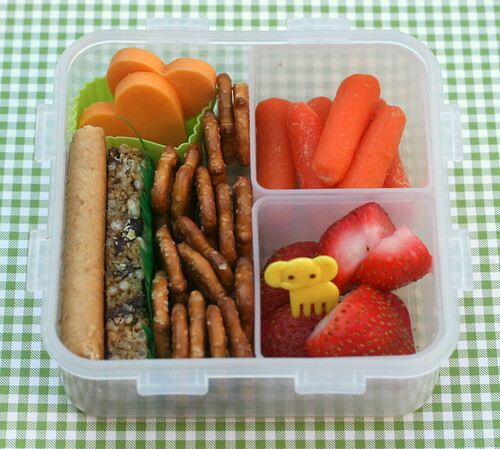 On the right: baby carrots, strawberries with elephant pick. On the left: Trader Joe's cereal bar, granola bar, pretzels, grassy baran to separate, cheddar cheese hearts. Packed in our tried and true "4 square" Lock & Lock box. - purple grapes and a clementine with leaf pick. The one big shake-up that's occurred with Ethan's school lunches is that he is actually eating THE school lunch the cafeteria serves up 1-2 times a week. I used to be able to use the threat of cafeteria food to whip him into behaving/cleaning his room/etc., but now he's usually game for it (for eating from the cafeteria, not necessarily behaving or cleaning his room). Sigh (again). Another new thing we are dealing with this year - his lunch time is at 10:30! Isn't that crazy? So he has lunch just two hours after school starting and then has five hours until he's home. He does get a snack in the afternoon, but it's definitely an odd adjustment for him. 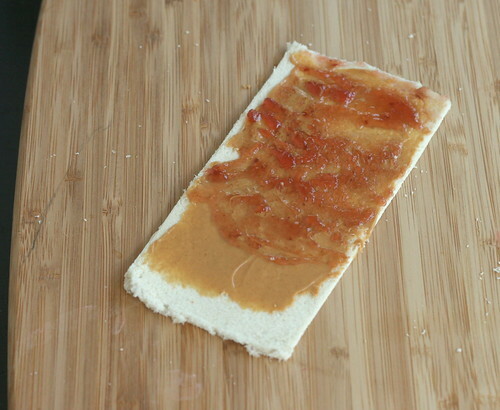 This is made with two whole pieces of white-wheat bread, the pb&j, strawberry and Annie's organic cheddar bunnies. 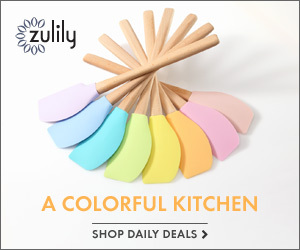 Step 1: gather your ingredients and supplies. 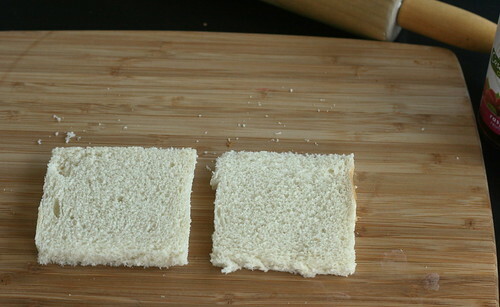 Step 2: take two slices of bread and cut off the crusts. Step 3: separate your pieces and prepare to smoosh. Step 4: smoosh gently. Slightly smoosh. This is not the grand squishing moment. 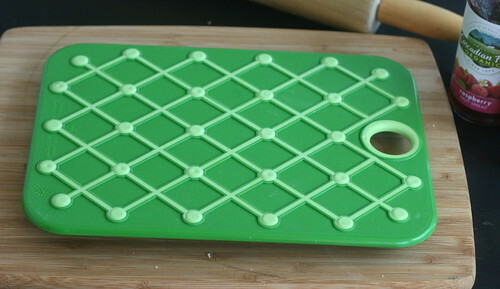 I like to lay a cutting board over the top and press. That usually works really well for me. See? 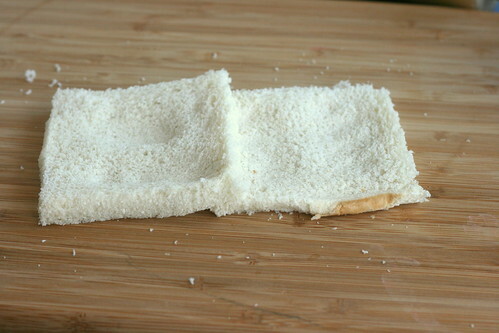 The bread is smooshed, but not totally flattened. This is important for the secret step coming up next. Haha, can you see my palm print and finger indentations in the bread? I had to fiddle so much with my camera between steps that the bread started puffing back up. I had to beat it back down into submission. 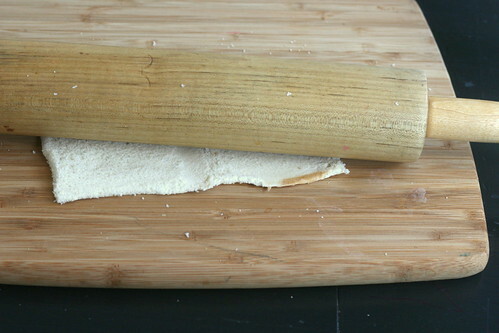 Step 6: Roll that sucker flat. Or smoosh like heck. Flatten it anyway you want. ta-dah!! One long piece of bread now! Step 7: Trim the edges so they are all nice and straight. 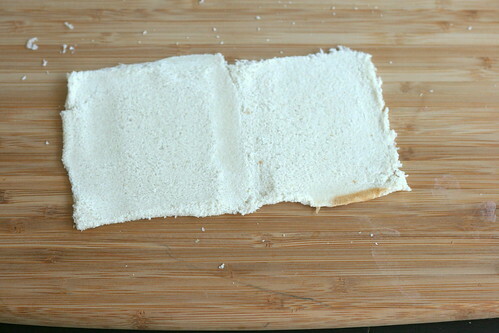 Step 8: Add your filling. 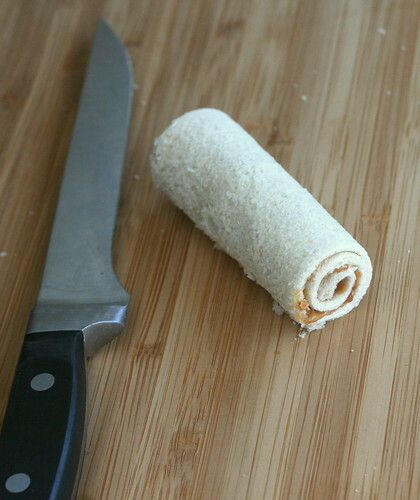 Whatever you use, whether pb&j or ham & cheese, leave a little space at the end because the contents tend to squish toward the end as you roll. Now, I could have spread mine a little more than I did here, like maybe half-way to the end more. The thicker your filling is the more it tends to creep to the end. 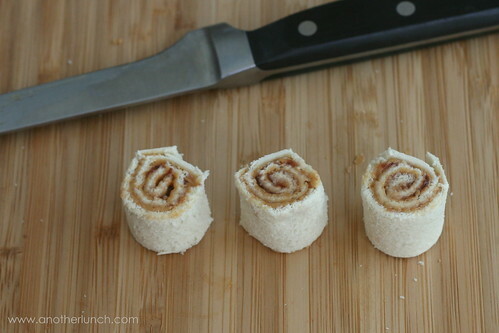 Step 9: Roll 'em on up. 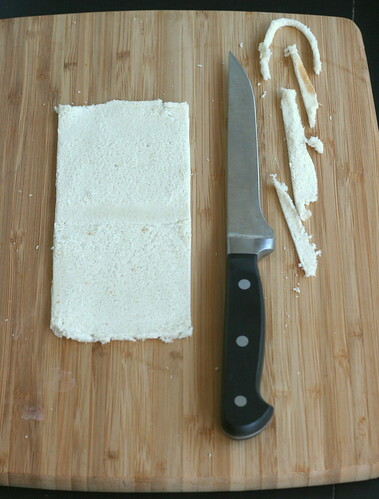 Then, slice with a sharp knife. 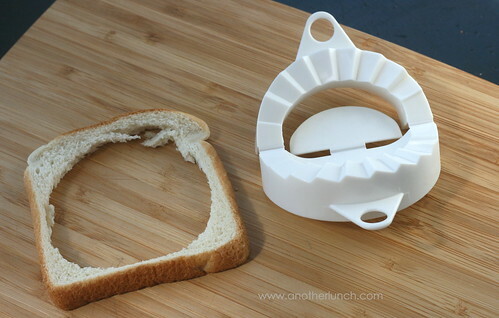 There's no other way a 2-slice-of-bread-sandwich would have fit in this tiny little box! 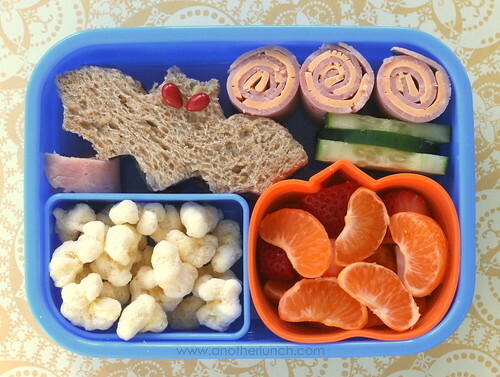 Here's my dapper bento lunch to celebrate. I ordered those cowboy-esque picks last year and I can't remember what the heck I was planning to do with them, but they seemed to tie in with my "back in the saddle" theme, so there they are in my apple slices. 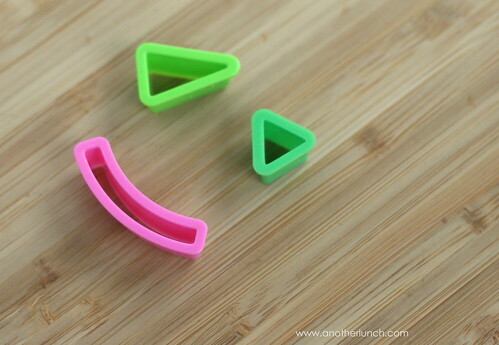 I cut out the "giddy up" from provolone cheese using mini alphabet cutters. A little grassy baran provides a barrier between my sandwich and the apples. My sandwich was so full the lid needed some help staying on, so a big rubberband held it together securely for an afternoon of errands. :) This was actually lunch and a snack for me. During the time I was on a blogging hiatus I really knuckled down on my health and have become a compulsive calorie (and macronutrient!) counter. And I've forged a deep love of exercise. It's such a fantastic avenue for stress relief. That's a great thing since my kids totally stress me out. Ha! I love going to the gym now. LOVE it. Oh hey, and I lost 50 pounds in the process. Yay me! I am really sorry I just fell off the radar for so long, I know when that's happened to bloggers I follow I get really worried that something happened to them or to their family...and on the occasions they popped back up and started blogging again like nothing happened and without explanation I'd even get miffed and wonder incessantly why had they disappeared? what were they doing? don't they care that I worried about them?! 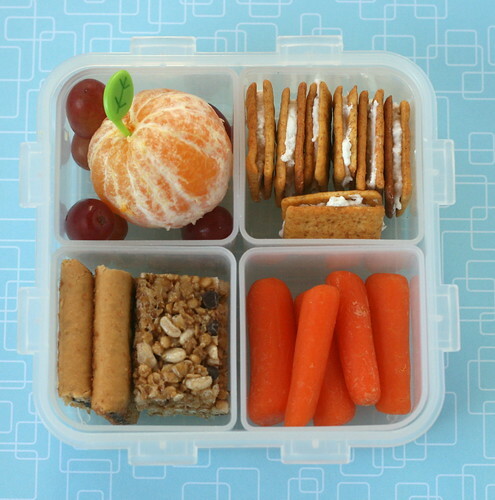 In the side sections are jalapeno almonds and organic baby carrots. Yum. 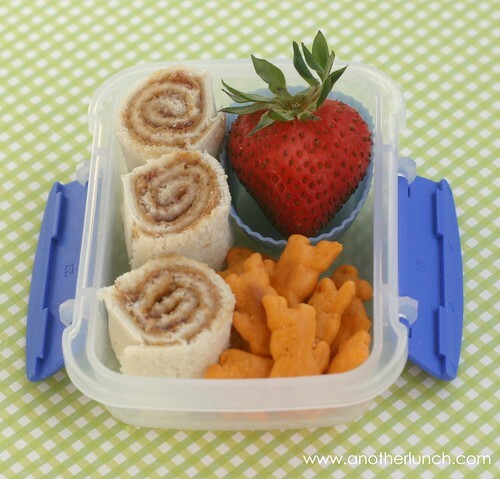 This is all packed in a fabulous EasyLunchboxes container! Oh. My. Gosh. 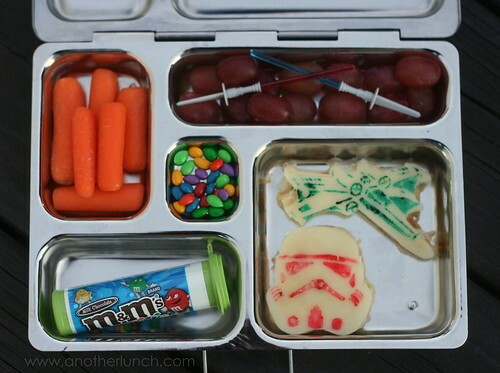 Making this bento nearly sent me over the edge! It was easily 100 times more frustrating than playing angry birds and just as addictive. I could.not.stop.myself even though I was on the verge of a full fledged psychotic meltdown. A psychotic meltdown thanks to these stinkin' guys! Stupid birds. Those darn "black ninja birds" (as I call them) were cursed. 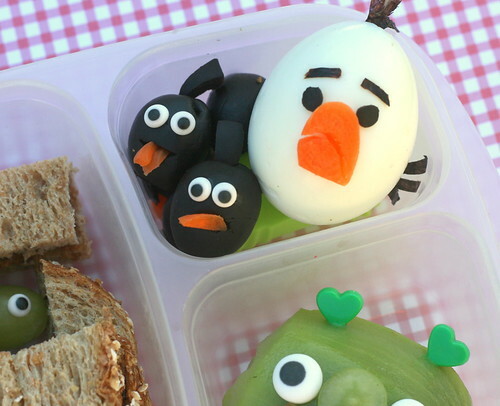 They are olives with icing eyes and carrot beaks. Icing eyes and carrot beaks that I could barely get to stay in place. There are three eyeballs that fell down the bottom of that compartment that I couldn't get back out without shifting things too much...and any movement sent them falling to pieces again. The big white do-do bird (as I think of him) is a hard boiled egg with carrot beak, nori feathers and eyebrows, and olive eye balls. His eyes are not right, but I couldn't have cared less at that point. I started this fiasco with these birds and I was already SO OVER the idea by the time I was half way done with them. 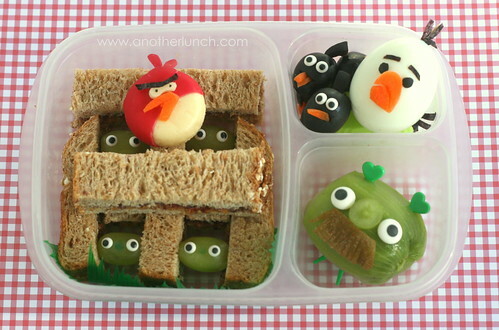 This is the dude who sparked the Angry Birds bento idea for me in the first place. You know I love my kiwi dudes :) and the big 'ol pig guy was made to be kiwi. A last minute notion was to take some of the kiwi fur to make a mustache. The mustache pigs always seem a little friendlier to me somehow. :) His eyes are large icing eyes and I stuck some bento picks in him for ears. I had planed to carve out some kiwi from the back to use as ears, but like I said, I was really ticked off at the bento by this point. Ha.